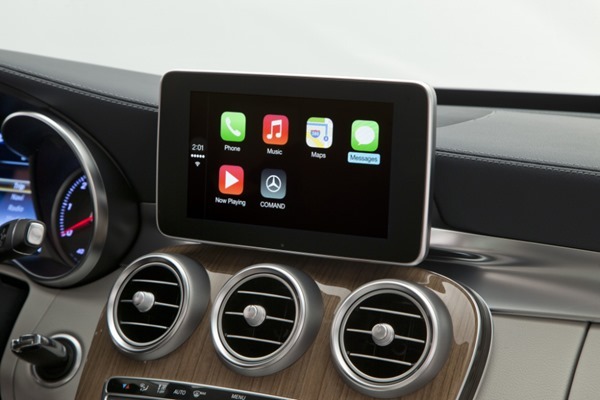 Yesterday, Apple took the wraps off CarPlay, its official name for the iOS in the Car tech we first witnessed at WWDC. Having only really gathered an insight into CarPlay via iOS 7.1 beta releases, we’re now starting to see what these integrated systems will truly be made of, and after Volvo yesterday showcased CarPlay on one of its own upcoming automobiles, German manufacturer Mercedes-Benz has done likewise for its soon-to-be-released fleet of C-Class cars. The new C-Class product line is expected to be showcased at the Geneva Motor Show later on this week, and even though the idea of owning a Mercedes is, to many, appealing enough, the added bonus of Apple’s in-car variant of iOS should make the experience of driving the C-Class that bit more pleasurable. Compared with Volvo’s implementation of CarPlay, though, which we saw late-on yesterday, Mercedes’ system doesn’t appear anywhere near as refined nor integrated. Rather than being molded into the head unit as a part of the car itself, the CarPlay display looks to have been simply dropped on, as if the owner of the car has driven down to their local auto warehouse, picked up a sat-nav system, and stuck it atop the dash with a suction cup. Not especially hi-tech-looking, to say the least. Nevertheless, the video, which is almost seven minutes long, offers a satisfactory walk-through of CarPlay and some of its key features in detail. As we’ve already seen, the user interface is very evocative of the traditional iOS as seen on the iPhone, iPad an iPod touch, and although Mercedes’ execution may appear botched from an aesthetic point of view, the demo video shows just how much the CarPlay system may enhance the driving experience. With a myriad of manufacturers, from Ferrari to Volvo, all getting in on the act, Apple’s CarPlay may well end up taking the automobile industry by storm. The vehicle makers currently showing off their new technologies are all expected to have at least one new CarPlay-ready car ready for release by the close of the year, and with the facilitating iOS 7.1 update also scheduled for release in the next couple of weeks, our beloved devices will also soon be geared up and prepped for CarPlay.